In a career spanning nearly sixty years and more than ninety albums, Archie Shepp has always been a risk-taking artist committed to the struggle for civil rights and to music as a voice in that struggle—a voice that refuses to submit to any one style or genre. He is more than just a free jazz pioneer, but a unifying figure who believes that sharing musical knowledge should be for the many not the few. He was rapturously received in a dark suit with a light pink tie and a crushed lilac scarf, part Cotton Club Rhythmaniac, part free jazz troubadour. Speaking or singing his voice is strong and his playing has held up well. Many jazz legends of his vintage at prestige gigs tend to sit it out for long periods. This is what Pharoah Sanders did last year in the same hall [REVIEW], and what we pretty much expect Abdullah Ibrahim will do this weekend closing the festival. Archie Shepp remains as committed onstage as he is offstage. The political consciousness embodied in his music gives it a strong sense of purpose and a wide-ranging musical inclusivity. His soloing is rich with the outside-the-scale explorations of free jazz that he helped to pioneer. The two-hour concert opened with a half-hour of quartet playing with Pierre Francois Blanchard on piano, Matyas Szandai on double bass, and Hamid Drake on drums. They performed two deep cuts representing the religious and the spiritual in art music: Coltrane’s Wise One (from Coltrane’s 1964 classic quartet album Crescent), and Ellington and Strayhorn’s Isfahan (written in 1963 and dedicated to the Iranian city, released on the 1967 album The Far East Suite). The band was tight and refined, but even Shepp’s typically rule-breaking soloing in this opening ‘art songs’ section hardly prepared us for the excitement to come in the spirituals. The stage was filled out with the addition of organist and vocalist Amina Claudine Myers, saxophonist Virgile Lefebvre, trumpeter Olivier Miconi, and the tremendous choir of nine put together by Marion Rampal and including Carleen Anderson and Cleveland Watkiss. The main ninety-minute programme of semi-secular spirituals ranged through an impressively varied palette. Kicking off with the joyous gospel surge of All God’s Children Got A Home In The Universe, the choir sang the roof off the Barbican hall. Shepp’s soprano solo in A Prayer was energetic and detailed, rich with his characteristic risk-taking outside notes. Amina Claudine Myers’ organ playing was bright and fulsome on her power gospel tune Call Him. This is a rousing, healing, nourishing music that moves your body and cleanses your soul—but a music not blind to the darker shadows of history. Blues For Brother George Jackson, from Shepp’s landmark 1972 album Attica Blues, is dedicated to the ‘Soledad Brother’ George Jackson, who was murdered by prison guards on August 21, 1971. He was “a young man who died too soon,” says Shepp, “and who is important to us even today.” The musical theme has a disarming and unsettling character fitting the historical theme. It continues to remind us that the civil rights struggle is still literally a matter of life and death. Ballad for a Child, from Attica Blues, was spine-tingling. The lyric “the whole world needs that smile” is as valuable as ever, even if only to save our sanity from our anger. The sentiment is not complacent, but a tonic. One of Shepp’s achievements is to combine gospel’s bright and beautiful overcoming appeal to the joy of living with an undiminished righteous anger. At the end, the hall rose to stand in a moving appreciation of Archie Shepp’s enduring importance. An audience member brought a final unforgettable moment to my experience of the concert. Last month we noted the anniversary of when, on October 16, 1968, Tommie Smith and John Carlos each raised a black-gloved fist at the 1968 Mexico Olympics during the National Anthem. This act of incredible bravery made a strong statement that cost them dearly but enriched history. 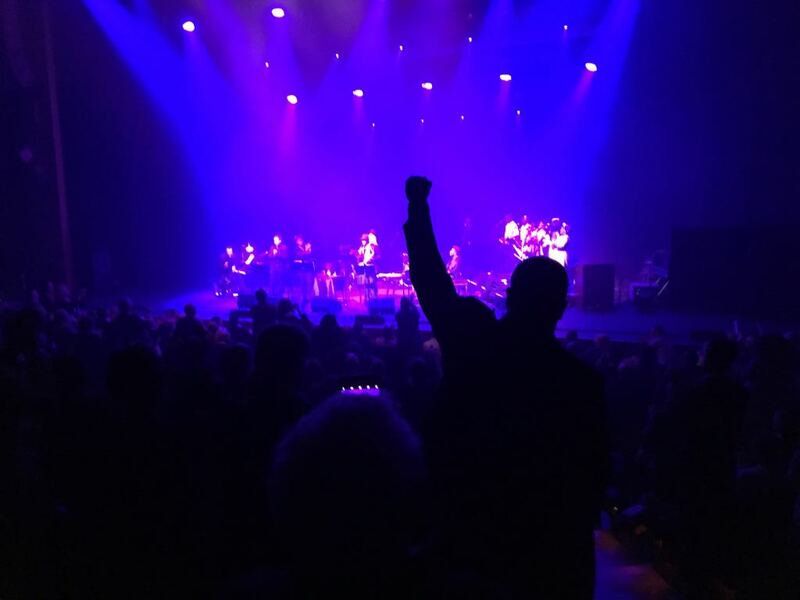 In front of me in the Barbican stalls, one gentleman raised the Black Power salute—and we’d like to offer our solidarity with everything that gesture represents. Excellent review of a great concert.